Remember when Danielle Mullins’ white binder of evihdunz was the most controversial thing happening on the 90 Day Fiance Tell All stage? Yeah, those days are gone. Because this year’s crew has pretty much topped out TLC’s hit show for deranged behavior, off-screen drama, and unhappily ever after endings. In real time, Colt Johnson has filed for divorce from Larissa Dos Santos Lima after her third (yes, THIRD) arrest for domestic battery. Jonathan Rivera and Fernanda Flores have split. And, it looks as if he fancies himself the next D-list Bachelor. Poor Ashley Martson was admitted to the hospital this weekend after being found unresponsive in her apartment (sources report she’s doing better now) from complications of Lupus. We don’t know whether she and Jay Smith are even still together. Steven Frend and Olga Koshimbetova are officially “on” since her visa was approved in December. Eric Rosenbrook and Leida Margaretha continue to post troubling videos about Leida being “suicidal” on social media. Kalani Faagata and Asuelu Pulaa are having baby boy number two. And effing EVERYONE has a GoFundMe. So…good times! But for our last installment of the season six Tell All, we’ll try to suspend disbelief and comment on the lunacy we saw last night. Because there was plenty to go around. Let’s link arms and stumble off the battlefield of this 90 Day Fiance season like the wounded soldiers we are. Viewers of 90 Day Fiance, I salute you! You deserve a medal. Part 2 of the 90 Day Fiance Tell All for season six airs tonight. The battle between Larissa Dos Santos Lima and Fernanda Flores rages on. Fernanda and Larissa hurl insults at each other. They are backed up by soon-to-be ex-husbands, Colt Johnson and Jonathan Rivera. There are even a few “Housewives” style walk-offs. At least we’re treated to a full-on traditional Samoan dance by our beloved Asuelu Pulaa at the end. This might wash away .001 percent of the grime we’re covered with after watching all of these couples act like fools for the past fourteen weeks. Last night, Shaun Robinson attempted to tame the wild beasts of the Season 6 90 Day Fiance cast. Alas, only Asuelu Pulaa came out unscathed – although we can’t be totally sure about his boohole situation. 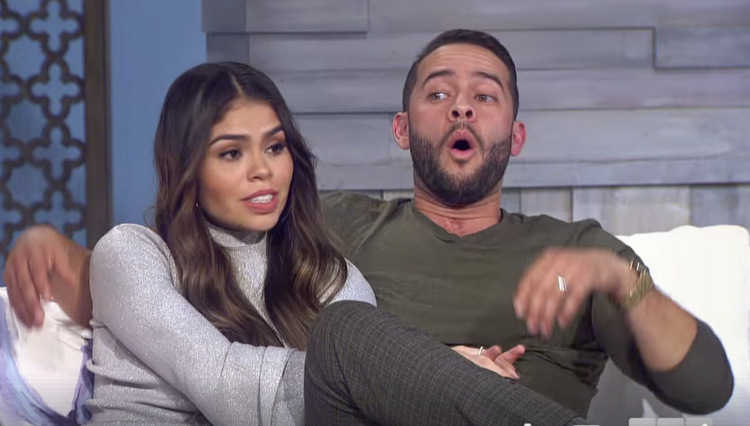 As the entire motley crew sat down for their traditional Couples Tell All reunion special, one thing was apparent: Eric Rosenbrook and Leida Margaretha are still the absolute worst. No contest. The reunion started off with intros all around, minus Colt Johnson and Larissa Dos Santos Lima, who decided to get there when they damn well felt like it! At least everyone else decided to show up for their ritual hazing, starting from left to right: Ashley Martson, Jay Smith, Kalani Faagata, Asuelu, Jonathan Rivera,Fernanda Flores, Eric, Leida, Steven Frend, and Olga Koshimbetova via Skype. The season six Tell All of 90 Day Fiance is almost upon us, and so is a heaping helping of more lies coming from Jay Smith’s mouth. Tonight, it looks like Jay is put on the hot seat pretty much right out of the gate. Host Shaun Robinson asks him just what the eff he was thinking creating that Tinder account? Ashley Martson argues that Jay never really committed himself to the marriage. Of course, Jay has plenty of excuses. At the top of the list: He just thought Tinder was a place to make “friends!” Aww, poor Jay. He’s just sitting around on the ole’ iPad and…BAM! He’s got twelve side chicks. It could happen to anyone. It was the best of times, it was the worst of times. Okay – maybe it was just the worst. But it’s over! (Until the Tell All next week, that is.) Last night ended our journeys with the six couples of 90 Day Fiance, season six. And for one, couple, their marriage barely lasted a day before all hell broke loose. It’s hard to believe season six of 90 Day Fiance is coming to a close. Somehow it feels like we’ve been on this ride way too long – like, carnival ride pukey long. But we’re finally at the end of this Fall’s bitter road to the altar and, for some, immediate divorce court. 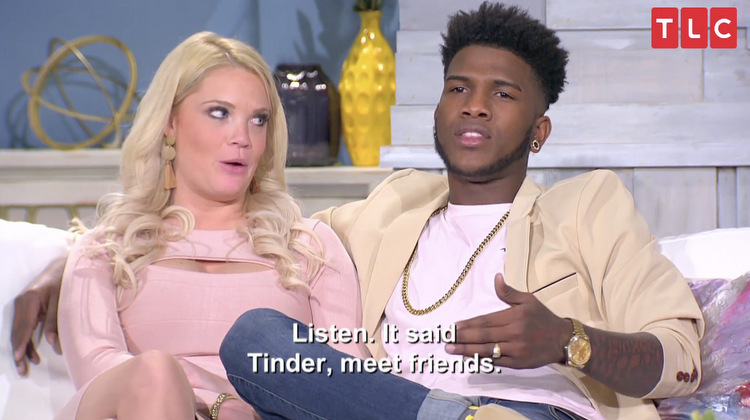 Speaking of bitter, Ashley Martson is still reeling after learning that her 20-year old husband of ONE WEEK, Jay Smith, created a Tinder profile and started flirting with other women immediately after their wedding day. Will she kick him to the curb? Can she? Will Natalie run over Jay with a scooter? We’ll have to tune in to find out. Next week is the finale of 90 Day Fiance. So we’re nearly at the end of the line. To all of you who have stuck with this 40-car pileup until the last vehicle careens over the cliff, I offer you a virtual appreciation ring atop of a windmill. Congrats to us! Last night was packed full of pre-holiday treats. So, let’s get to it, starting with The Horror In Baraboo. Since kicking Tasha Rosenbrook out, Eric Rosenbrook and Leida Margaretha have been feeling pretty pleased with themselves. But Eric thinks things can be salvaged with one conversation. He meets all three of his daughters at a local diner to talk about what a sh*tbag father he is. 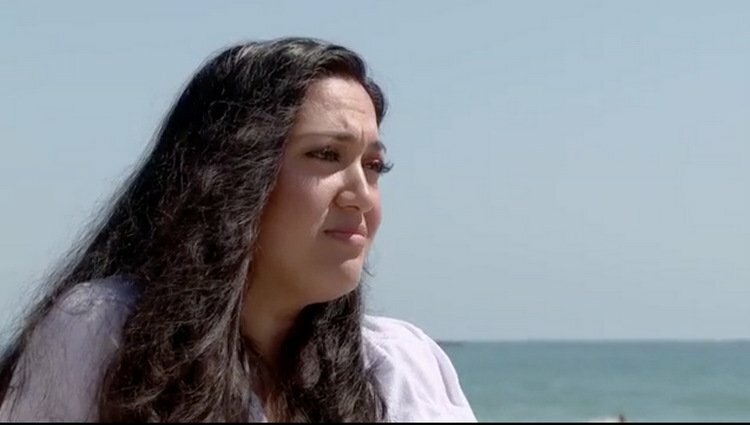 Eric’s youngest daughter is scarred from watching the fight between Leida and Tasha. Of course, Tasha is still very upset about being tossed out like trash. “What’s done is done,” barks Eric, claiming he had “no control over how it played out.” Um…WHAT? The situation for some of the couples on 90 Day Fiance seems so dire, we have to wonder what will becomes of them once the cameras stop rolling and the Instagram followers fade away. But tonight, a few of them try to turn their trainwrecks around. Colt Johnson and Larissa Dos Santos Lima have been at odds nearly every minute since Larissa landed in the un-airconditioned hell of Colt’s world. Mother Debbie isn’t making life easier for the couple, so Larissa decides to confront the issue head on tonight. Will these two broads be able to live in Sister Wife harmony with Coltee from this day forward?